Lunchbox Dad: Is Walmart Family Mobile the Best Wireless Option to Win Your Fantasy League? 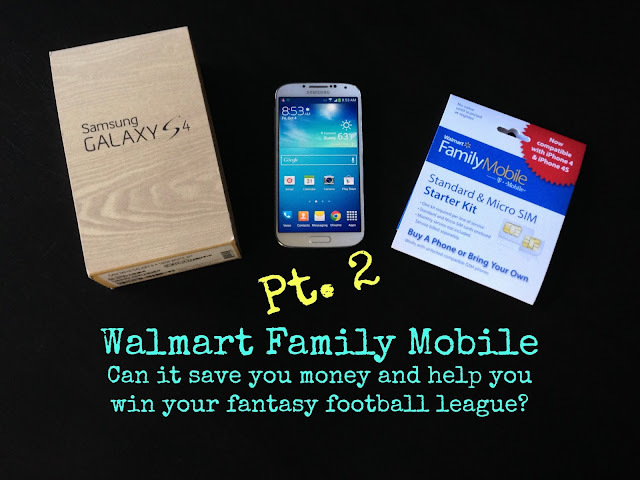 Is Walmart Family Mobile the Best Wireless Option to Win Your Fantasy League? I didn't want to like it. I tried to resist, I swear. I was an "Apple" guy and I felt like I was betraying my own. But man is the Samsung Galaxy S4 nice. The big screen is beautiful and the phone runs like a cheetah. But how would it perform using the Walmart Family Mobile Plan? In my last post about this I told you how much money this cheap wireless plan could save you, but I still needed to do real world testing. Just as important, I needed it to help me get the edge in my fantasy football leagues. To read my first post about Walmart Family Mobile which documents my initial experience (including savings chart) click HERE. After a month of taking this phone everywhere, and putting it through the ringer, I was pleasantly surprised. Thanks to Walmart Family Mobile I am also keeping pace in most of my fantasy football leagues! So here are the results of using the Samsung GS4 and Walmart Family Mobile. This might have been my biggest surprise. Walmart Family Mobile is on the T-Mobile network. Normally I don't think of T-Mobile as having as good of coverage as the other companies, but in my house the GS4 is now my go-to-phone. No other network gets more than one bar where I live. T-Mobile came in loud and clear with full coverage all through my house. I told that to others in my neighborhood and they were thoroughly impressed. Around town coverage was pretty good. You never get perfect coverage everywhere but for the most part it was as good or better than the other major carriers. At my work, my signal was up and down. This was strange since my current cell provider gets perfect 4G LTE. I was able to get good coverage at my desk, but walking around the campus it was all over the map. I don't know why this is. Overall, I was very happy with the coverage, even though Walmart Family Mobile does not provide 4G LTE. The 3G speeds were fast enough to load pages in a good amount of time. Even when it said I only had one bar, I was still able to surf the internet and send texts with no problems. I did have a few dropped calls, which was a little annoying, but not enough for me not to give the Walmart Family Mobile coverage a high recommendation. To check the coverage map for your areas click HERE. I said before that I was an Apple guy. I immediately liked the look of the Samsung Galaxy S4 but it took a few days to get used to the Android operating system. I downloaded a few apps, starting with the three that I needed for my fantasy football leagues. My favorite feature of Android is the notification center. I love having new email, Facebook messages, and fantasy football news right at my finger tips. I did find the native email app to be clunky and not practical to check email quickly. One of the best features of the S4 is the large screen. It is five inches and the resolution is 441 pixels per inch. I thought it would be heavier than it is, but it feels light for its size. The tradeoff is not being able to fit the phone in your pocket easily. 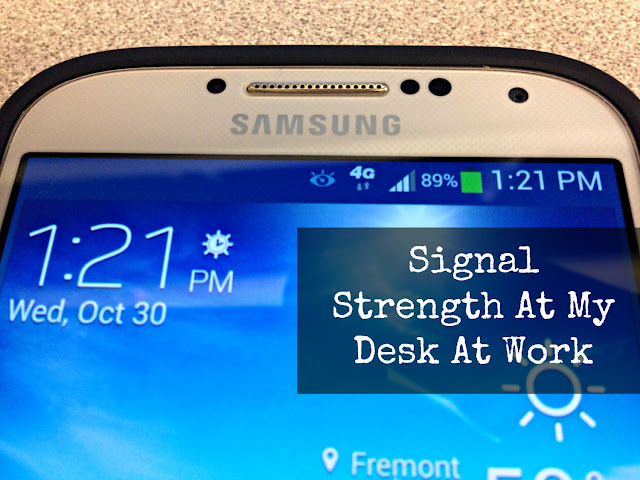 You can read about my in-store experience buying and activating my Galaxy S4 HERE. 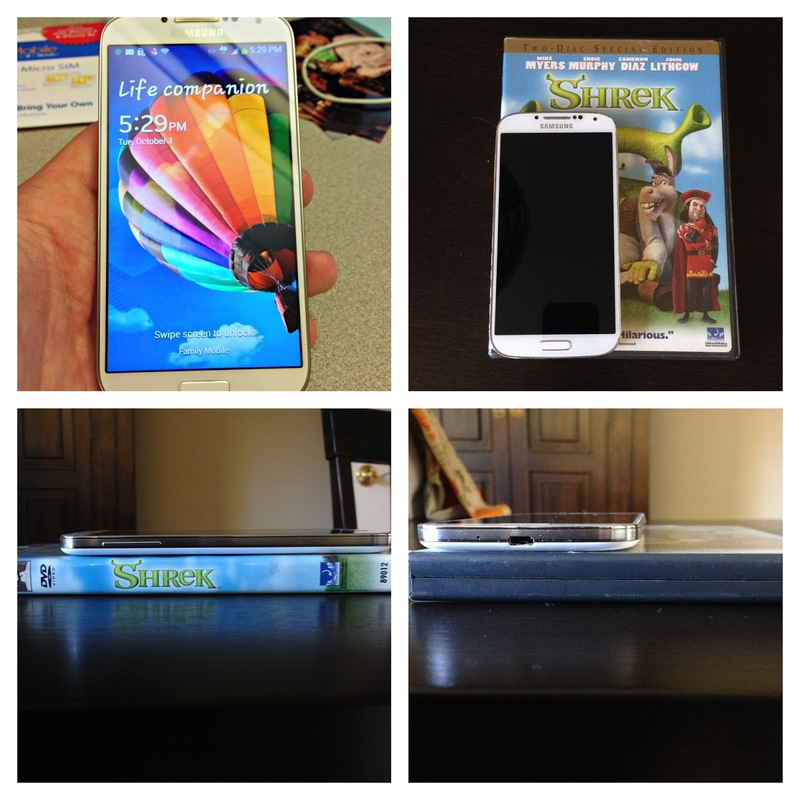 the size of the phone relative to a standard size DVD case. One of the most important features of a phone for me, is being able to stay up to date in my fantasy football leagues. The GS4 and Walmart Family Mobile definitely accomplished this purpose. I was able to offer trades, make lineup changes, and check scores when it wasn't possible for me to be at a computer. For example, On October 5th, I picked up tight end Brent Celek when I realized at the last minute that I had no tight end to play the next morning. He helped for a week but wasn't a long term solution. The next week, in a staff party, I used my phone to complete a deal with a coworker to bring Tony Gonzales to my team. I knew I needed to negotiate and close the deal right there. I found my new tight end and I couldn't have done it without my phone. One other highlight came on Sunday, October 20. This of course was game day and I thought my lineup was ready to give me the win. Unfortunately, I didn't realize I had a player who had suddenly become inactive. Minutes before game time, I was able to sub him out and put in wide receiver Cecil Shorts. Once again, Walmart Family Mobile saved my week. For the record I am currently tied for first in my division in one league, and a close second in another. We won't talk about the third league I'm in, but its not the phone's fault, it it my own. A great phone and plan can't help bad decisions. 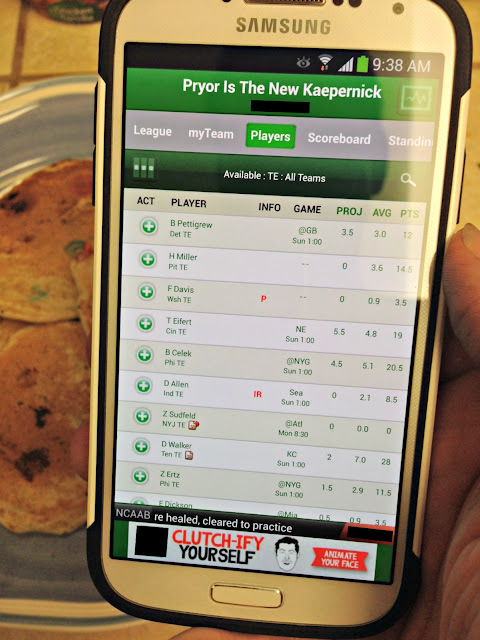 Is this the best wireless option for fantasy football fans? I'll just say this fantasy season would have been lost if I would not have had my phone with me. Walmart Family Mobile is a great cheap wireless plan when you want to save money and need up to the minute details on your fantasy team. Most smartphone plans are expensive, but this unlimited no-contract plan gives you an affordable alternative. At only $39.99 per month I was able to cut $45 off my normal smartphone bill. Online account management is very simple but won't always give you every little detail you need. To see for yourself what their account management is like click HERE. The T-Mobile network isn't perfect, but it does provide reliable coverage. You won't get 4G LTE or visual voicemail with Walmart Family mobile, but if you can live without those options then you should give this plan a shot. Your fantasy football season depends on it.